Too bad I didn’t serve this on a different colored plate! The picture would have been perfect. Next time! 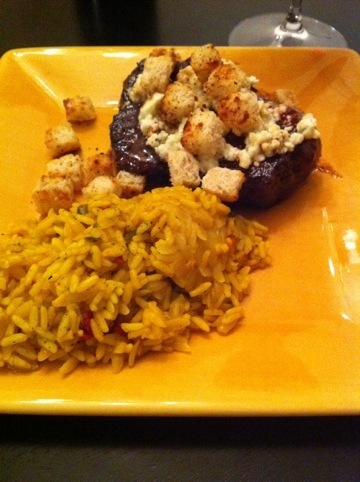 This is a picture of filet with blue cheese crumbles and homemade croutons with a side of Spanish rice. I was looking for a recipe with blue cheese since my husband likes it so much, but like I have mentioned before, I’m not really a fan. I found this recipe on allrecipes.com and decided to try to make it because it seemed simple enough! Anyway, the most surprising part of this whole experience was that I really enjoyed the entire meal! Including the blue cheese which is something I tend to stay away from. Definitely will be making this again!